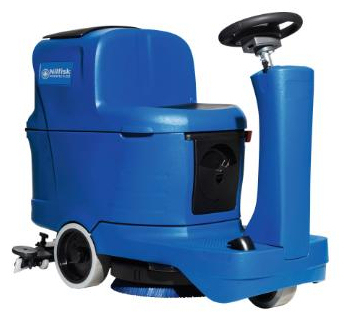 The SCRUBTEC R 253 is the first Nilfisk ride-on machine in the micro scrubber dryer category. Available at the same price level as a walk-behind model, it will significantly add to both working speed and user comfort to our range. Cleaning can be carried out at 6 km/h while driving compared to 4 km/h when walking and having to push a heavy machine. Meaning “taking a ride” can actually increase the productivity of your indoor cleaning by up to 50%. SCRUBTEC R 253 is ideal for light and medium cleaning of large indoor areas such as in warehouses, small industries, and automotive facilities. Users will find it easy to drive and control, and thanks to its large water tanks the machine goes the distance with limited need for empty/refill. The SCRUBTEC R 253 will run for up to 3.5 hours before the high-capacity batteries must be replaced or recharged.